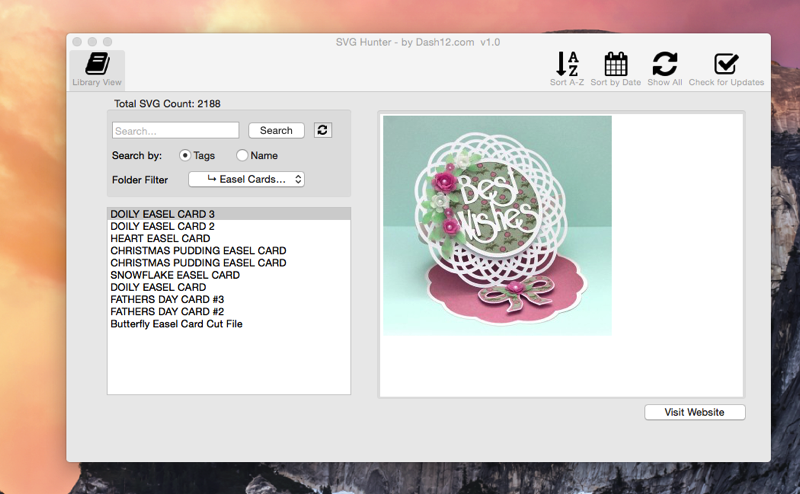 SVG Hunter is a program that works on Mac or Windows computer to allow you to search and find Free Premium SVGs for you to use with your cutting devices. We at SVGHunter.com have created a database where we have tagged and hunted down these patterns with keywords for easy searching. 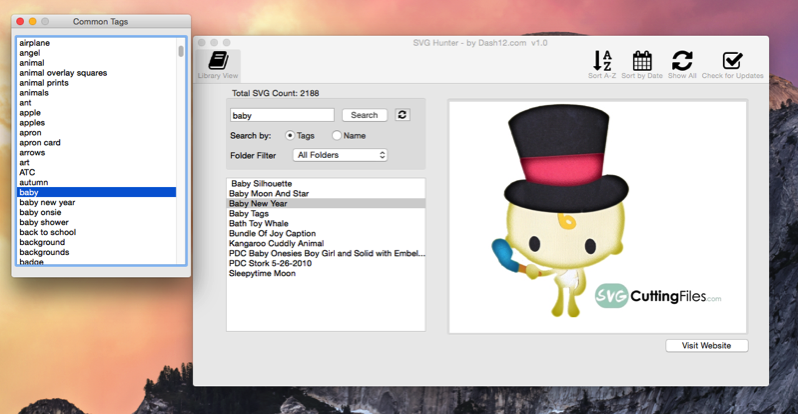 Easily find the SVG files that you are looking for. You have the choice between searching based on Tags or by File Name. You can also filter by designer/website. Let’s face it there’s a lot of SVG files out there. SVG Hunter will only display those of quality and it will give you the option to visit the creators page that has the download link. As a member you’ll be able to download the latest and greatest database that unlocks the ability to find and download the SVG files that you may need for a project. Every week we search the major websites looking for and finding those free premium SVGs that were recently made available. 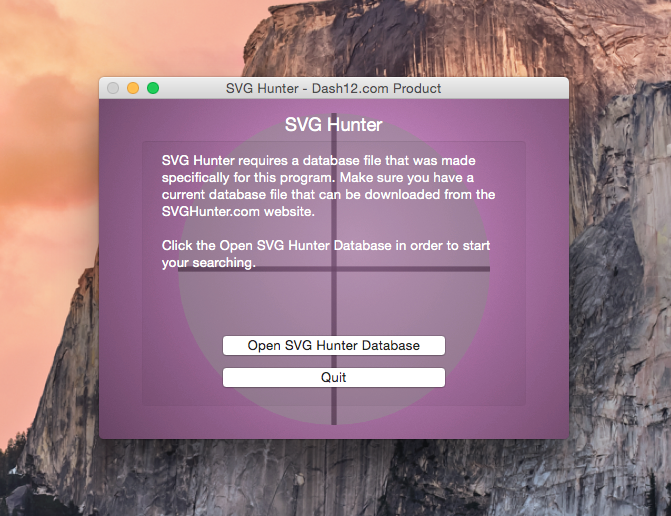 *SVG Hunter does not store any SVG data nor photos on your computer. It provides links that take you directly to the designer’s website for download. After we index the websites we apply tags to all of the SVGs to make it easy for you to find what you’re looking for. You can view a list of all the tags being used via the Tag Window. Easily drop and drag those keywords into the search box and see what populates. Once you find the SVG you’re looking for, click the Visit Website button and you’ll be taken to the Designer’s website where we’ve found the SVG. Sometimes this will take you to a store or a blog. Make sure you leave a nice comment thanking them for having their SVG available to you! An internet connection is required in order for this program to work. The internet is needed to display the images as well as visit the designer’s website in order to download the SVG. This program works on Windows Vista/7.0 and above. Mac OS version 10.7 and above. Every month SVG Hunter’s access code will be changed. You’ll need to log into the members area in order to get the new access code. You’ll get access to the monthly download of the database that will be updated and maintained weekly. Once you sign up you’ll be given an email with login and password. It is on the member page where you’ll be able to download the program as well as get the database. This program is set up as an automatic renewal. Access Codes are set to expire on the 1st of the each month. At that time you’ll return to the members page to retrieve the latest Access Code. You can cancel the membership at any time through PayPal. All annual sales/payments are final. Access to the database/svghunter will continue to be active until your anniversary date. After signing up please check your email (PayPal) for your login details. This may be in your SPAM Folder.